Michael Raphael O’Halloran, who travelled the outback to meet and make friends with swagmen, labourers, railway men and graziers, once said that it was easy ‘for a man to be a politician’, but ‘hard for a politician to be a man’. He was born on 12 April 1893 at Yanyarrie, near Carrieton in South Australia. His father, James Andrew O’Halloran, was a farmer of Irish stock, and his mother was Mary Catherine, née Brown. An only child, young Mick attended state schools at Pamatta and Redhill, where his lunchtime habit of reading Hansard was noted by a fellow student. Supporting his mother after his father’s death in 1910, he took up mixed farming at Carrieton, then at Belton. He continued his farming interests throughout much of his parliamentary career, specialising in merino sheep breeding, moving into Peterborough in 1938 and selling the property at Belton in 1949. As a young man he worked for a time as a country storekeeper. At the age of fifteen, inspired by a neighbouring Englishman’s Fabian publications, he joined the ALP, his motivation being to help people on the land by improving their working conditions. He was a member of the Australian Workers’ Union, and became active in the party organisation, serving on the state executive, attending federal conferences and completing a term as state president (1925-26). In 1918 he stood successfully for the South Australian House of Assembly seat of Burra Burra. He was one of only seventeen Labor members in a house of forty-six seats, despite Labor’s 49 per cent share of the vote. In his first speech he spoke of the many men who had come from their farms to represent the ALP. O’Halloran’s experience as a farmer in the marginal country north of Goyder’s Line influenced his advocacy of Labor’s policy of closer settlement. He spoke of the ‘community of interest among all wealth producers, irrespective of whether that wealth is produced from the farm, the fruit garden, or the mechanic’s bench’ and consistently thereafter endeavoured to advance the cause of all workers in city and country. Particularly concerned with railways and wheat, he also espoused causes such as equal pay for women teachers, and the better treatment of stock on animal welfare grounds. With industrial relations a major issue in the South Australian Parliament, O’Halloran and his Labor colleagues, with the support of the dissident Nationalists, brought about the defeat of the Liberal–National Coalition’s Industrial Code Bill of 1919, intended to deny rural workers and some public servants access to the industrial court. When, despite the split between the Liberals and Nationalists, the former were returned to office at the 1921 elections, O’Halloran lost his seat. Standing for ‘vigorous closer settlement’, improved rural schools and better managed railways and roads, he regained his seat in 1924, when the Liberal Federation and the Country Party Association engaged in futile three‑cornered contests, which resulted in a resounding election victory for Labor. One of ten farmers in the Assembly, O’Halloran had urged not only closer settlement, but the establishment of an agricultural bank and a system of cooperative marketing, but to no avail as Labor lacked a majority in the Legislative Council. From 1924 to 1927 O’Halloran was chairman of the Parliamentary Standing Committee on Railways. Defeated again in 1927, he became Labor’s state organiser. He then turned to the federal political sphere, standing for the Senate at the 1928 election, which was held in the aftermath of the waterfront dispute. O’Halloran was one of the three successful Labor candidates for the Senate in South Australia, alongside J. J. Daly and A. A. Hoare. O’Halloran’s term commenced immediately, both he and Daly succeeding to the short casual vacancies filled previously by Senators Robinson and Verran. O’Halloran belonged to three minority groups in the Senate; he was one of seven Labor senators; he was a farmer and grazier; and he was a Roman Catholic. According to an analysis by the political scientist, Joan Rydon, up to 1948, fewer than 9 per cent of federal ALP members were graziers, pastoralists or other farmers, and only 14 per cent of federal parliamentarians for South Australia were Roman Catholic. O’Halloran was, however, always proudly anti‑sectarian in all his parliamentary dealings. He was also concerned with all who lived in his vast electorate of South Australia, including the outback, which he traversed by motorbike or by horse and buggy. He had come to the Senate in the last months of the Bruce–Page Government, when industrial unrest was a major issue. His early contributions touched on the themes that preoccupied him throughout his life: a ‘fair go’ for Australian workers, fair treatment for South Australia by the Commonwealth and the advancement of rural Australia, particularly by protection of primary industry. He opposed the Transport Workers Bill of 1929, arguing that the main disabilities affecting primary producers were not wage costs and shipping delays but the burden of maintaining production on marginal lands and the capital costs associated with inflated land prices. He questioned the wisdom of the assisted immigration schemes during a period of high unemployment, upheld the decision of the public service arbitrator to grant allowances to public servants transferred to Canberra, and unsuccessfully moved an amendment to include a representative of grape-growers on the wine marketing control board. He maintained his commitment to closer settlement and supported a proposal for an inquiry into Australia’s primary industries moved by Senator Lynch. He opposed the Financial Agreement Validation Bill, urging the restoration of per capita payments to the states. As a wheat grower himself, and at a time of great need for export income, O’Halloran’s was an authoritative voice as he supported in 1930 and 1931 the Scullin Government’s attempts to introduce a fixed price for wheat and a compulsory marketing pool. 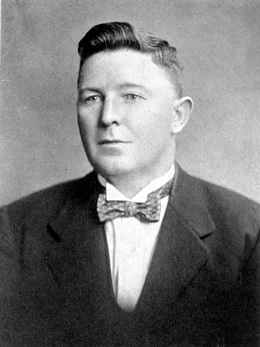 Despite all but one of Labor’s measures on wheat marketing failing in the Senate, O’Halloran continued to argue for compulsory wheat pools and bounties, and later opposed vigorously the Lyons Government’s sales tax on flour. Closely involved in the politics of the Depression, O’Halloran supported Labor’s various attempts to meet the situation with such measures as the Central Reserve Bank Bill and the Fiduciary Notes Bill. But his support of the Premiers’ Plan (hammered out in May and June 1931) resulted in his expulsion from the South Australian Labor Party in August along with Senator Daly and twenty-three state parliamentarians. On 19 November, at a Federal Executive meeting to which Scullin and some federal ministers were invited, O’Halloran and Daly were reinstated without reference to the South Australian state executive. Other countries are affected by the depression, and have need to exercise economy; but so far from abolishing their public accounts committees, they are extending the committee system, and tightening up methods of control so that members of Parliament may be assisted in the discharge of their duties and responsibilities as custodians of the public purse. His support for the Senate itself was more muted. In 1931 he voted for a motion by Lang Labor’s Senator Dunn calling for a referendum on the abolition of the Senate in accordance with Labor policy of the time. Nonetheless O’Halloran saw the Senate’s chief role as the guardian of state interests with a ‘responsibility to see that the burdens and benefits of federation are equally shared’. In the 1934 election O’Halloran failed to hold his Senate seat. In what proved a complete debacle for Labor, not one of its Senate candidates was returned—their failure can be attributed to the divided state of the ALP following the defections from the Scullin Government of the Lang and Lyons followers in March 1931. O’Halloran was again an unsuccessful candidate in the 1937 election, which saw three United Australia Party candidates gain Senate seats for South Australia. Unwilling to relinquish a parliamentary career, in 1938 he re-entered state politics as MHA for Frome, his personal following so strong that on five occasions between 1941 and 1953 he was re-elected unopposed. In November 1949 he became deputy leader of the Parliamentary Labor Party. Three years later he became leader, holding the position until his death in office. The first Catholic to lead the ALP in South Australia, O’Halloran helped prevent a ‘sectarian’ split in the state branch of the party during the 1950s. O’Halloran spent his final twenty-two years (1938–60) in the House of Assembly on the Opposition benches during the period in which Thomas Playford was Premier of South Australia. He has been criticised, particularly by a subsequent premier, Don Dunstan, for being too supportive of the Playford regime. It is indisputable that ‘Mick and Tom’ were close friends—and pragmatic politicians. In his 1950 policy speech, O’Halloran, who claimed that many measures introduced by Playford were ‘filched from Labor’, described the Premier’s policy of government assistance to industry as ‘more socialistic than Labor could ever hope to implement even if it were in office’. The South Australian journalist Jeff Medwell, referring to O’Halloran as having been seen as ‘Playford’s “junior partner”’, claimed that O’Halloran considered his role as Opposition leader ‘co-operative rather than competitive’ but that if he disagreed with a bill ‘he fought it clause by clause’, often forcing the Government to accept his amendments. O’Halloran’s prime concern remained ‘the man on the land’; it is not impossible that even the notorious ‘Playmander’ (under which rural areas obtained twice as many seats as those in metropolitan areas) was of less significance to him than the well-being of his rural electorate. In 1953 Playford and O’Halloran, accompanied by their wives, travelled to London to attend the coronation of Queen Elizabeth II, O’Halloran also representing the Australian states at a meeting of the Commonwealth Parliamentary Association. During a stopover in Rome, Playford arranged for the party to have an audience with the Pope. On 14 May 1924, O’Halloran had married Mary Frances Rowe, at St Gabriel’s Church, Cradock, north of Carrieton. They had no children of their own but enjoyed the affection of a nephew and niece. A tennis player, footballer and cricketer in his youth, and a keen follower of the horses, O’Halloran, a man of solid build, was accounted ‘a vigorous debater, with a wide knowledge of political and economic matters’. He spoke deliberately, had ‘a strong, resonant voice with a touch of Irish brogue’ and a fondness for the bottle and his pipe. O’Halloran died on 22 September 1960 at Calvary Hospital, North Adelaide. Survived by his wife, he was buried at Centennial Park Cemetery after a Requiem Mass at St Francis Xavier’s Cathedral. Still in office as Leader of the Opposition, he was accorded a state funeral with Playford among the pallbearers. At the subsequent by-election, Frome was held for the ALP by a margin of only eleven votes. The lead editorial in the Adelaide Advertiser following O’Halloran’s death commented on his steadfast advocacy of decentralisation, his intense party loyalty, his concern ‘with the merits of legislation rather than . . . party political advantage’, concluding that ‘in Mr O’Halloran the [Labor] party found a Parliamentary leader who combined ability with a rare understanding of both rural and urban problems’. Registered at birth as ‘Michael’, O’Halloran seems to have spent some of his life spelling his Christian names ‘Micheal Rapheal’. See Senate Registry File, A8161, S206, NAA; ‘Personalities Remembered’, Radio Talk 5CL, 12 Dec. 1971, D5390, SLSA; Advertiser (Adel. ), 23 Sept. 1960, p. 7; J. C. Bannon, ‘O’Halloran, Michael Raphael’, ADB, vol. 15; Carrieton Centenary Book Committee (comp. ), Carrieton in the Gum Creek Country: A Story of One Hundred Years of the Carrieton District, 1878–1978, Carrieton, SA, 1978, p. 27; News (Adel. ), 22 Sept. 1960, p. 22, 22 Feb. 1950, p. 4; Australian Worker (Syd. ), 4 Dec. 1929, p. 7. M. R. O’Halloran, ‘Labor’s Land Policy’, in Sid O’Flaherty, A Synopsis of the Formation and the Historical Records of the Australian Labor Party, South Australian Branch, 1882–1956, Adelaide, 1956, pp. 40–1; SAPD, 15 Aug. 1918, pp. 246–54, 14 Oct. 1919, pp. 1192–3; Orroroo Enterprise and Great Northern Advertiser, 25 Mar. 1921, p. 4, 28 Mar. 1924, p. 7, 25 Mar. 1927, p. 3. Joan Rydon, A Federal Legislature: The Australian Commonwealth Parliament 1901–1981, OUP, Melbourne, 1986, pp. 135, 162; CPD, 7 Mar. 1929, pp. 833-7, 21 Feb. 1929, pp. 424, 434-7, 19 Mar. 1929, pp. 1380-4, 1395-9, 14 Mar. 1929, pp. 1178-82, 1187-93, 15 Mar. 1929, p. 1266. CPD, 26 June 1930, pp. 3288-99, 20 Mar. 1930, pp. 274-9, 1 Dec. 1932, p. 3337, 19 Oct. 1933, pp. 3602-4, 7 & 8 Dec. 1933, pp. 5964–9; Geoffrey Sawer, Australian Federal Politics and Law 1929–1949, Carlton, Vic., 1963, pp. 17–18, 53–4. CPD, 23 Apr. 1931, pp. 1198-204, 17 Apr. 1931, pp. 973-81, 14 July 1931, pp. 3772-3, 8 Mar. 1932, pp. 721-6, 29 Sept. 1932, pp. 919-25; Patrick Weller and Beverley Lloyd (eds), Federal Executive Minutes 1915–1955, MUP, Carlton, Vic., 1978, pp. 12, 168–9. ‘Personalities Remembered’, SLSA; CPD, 31 Aug. 1932, p. 16, 16 Oct. 1931, pp. 790-4, 1 Dec. 1932, pp. 3307-12, 12 Nov. 1931, p. 1635, 24 Oct. 1933, p. 3773. SAPD, 1 Nov. 1949, p. 1142; Jim Moss, Sound of Trumpets: History of the Labour Movement in South Australia, Wakefield Press, Netley, SA, 1985, p. 360; O’Flaherty, A Synopsis, p. 59; Advertiser (Adel. ), 23 Sept. 1960, p. 3. Sun-Herald (Syd. ), 15 Mar. 1959, p. 48; Dean Jaensch (ed. ), The Flinders History of South Australia: Political History, Wakefield Press, Netley, SA, 1986, pp. 248, 252, 258; Don Dunstan, Felicia: The Political Memoirs of Don Dunstan, Macmillan, South Melbourne, 1981, pp. 22, 36, 40–1, 74; SAPD, 26 July 1950, pp. 79–87, 5 Nov. 1958, p. 1569; ‘Personalities Remembered’, SLSA; Advertiser (Adel. ), 19 Mar. 1953, p. 2; Stewart Cockburn assisted by John Playford, Playford: Benevolent Despot, Axiom Publishing, Kent Town, SA, 1991, pp. 217–19. SAPD, 22 Sept. 1960, p. 1092, 4 Oct. 1960, pp. 1093-4; CPD, 22 Sept. 1960, pp. 623-4; News (Adel. ), 22 Sept. 1960, pp. 1, 22, 37; Advertiser (Adel. ), 23 Sept. 1960, pp. 1–3, 7, 38. This biography was first published in The Biographical Dictionary of the Australian Senate, vol. 2, 1929-1962, Melbourne University Press, Carlton, Vic., 2004, pp. 260-264.